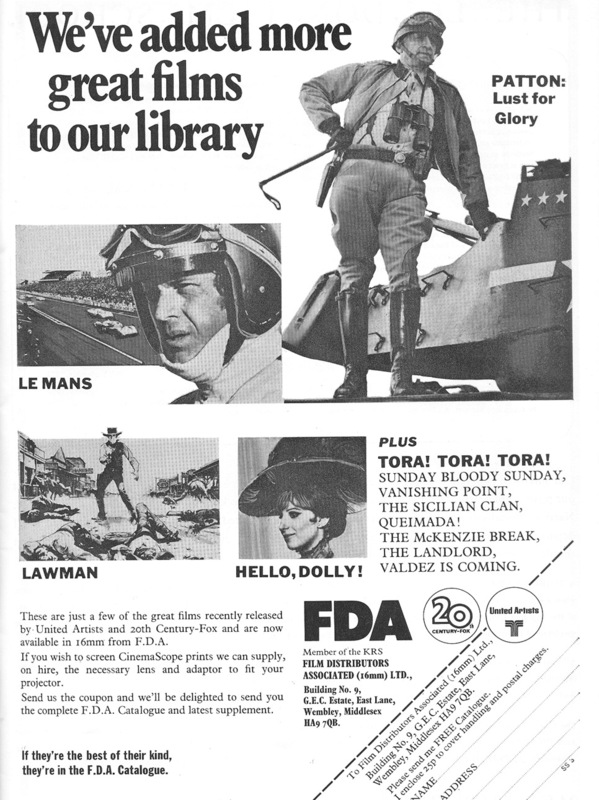 An advert from the Winter 1972/3 edition of Sight and Sound. I love Sight and Sound magazine, even though I hold it personally responsible for the mediocre 2.2 degree I attained at university. It’s true. Much of my final year at Manchester was spent in the campus library, desperately trying to undo the results of two previous years of hedonism largely based around the university’s excellent Film Society. But during a break in studies one day, I discovered that the library had bound volumes of Sight and Sound (and its companion review magazine, Monthly Film Bulletin) going back several decades. The study breaks got longer and longer after that, ultimately leading to the Desmond that blights my academic record to this day. I had a massive Proustian rush when I recently visited the new library at BFI Southbank, and found those same bound volumes taking pride of place on its shelves. 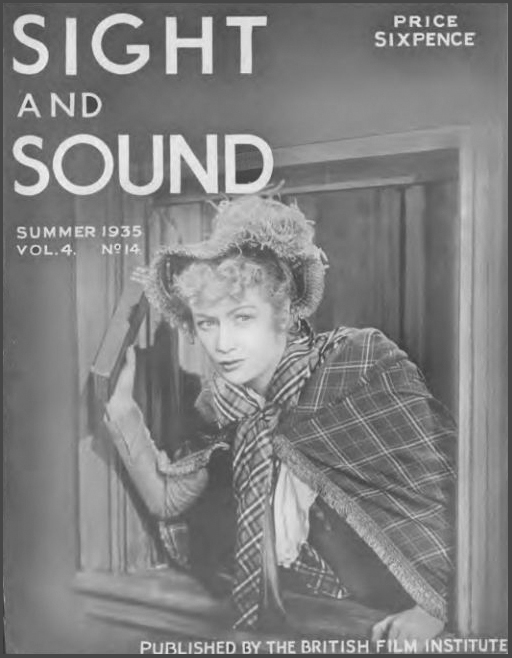 So imagine my delight when I discovered shortly afterwards that it was now possible to access every issue of S&S and MFB online, through the newly-created Sight & Sound Digital Archive. Well, that’s the theory, anyway. The online demo makes the Archive look like the loveliest thing in the world. At first, it may appear that they’re only showing you a single issue, but click on the archive tab and you’ll find they’ve got digitised copies of nine full editions of Sight and Sound, plus four full years of Monthly Film Bulletin. The MFBs are especially entertaining, featuring synopses, credits and reviews for every film released in that year (a function that was eventually taken over by S&S when the two magazines merged in 1991). As an existing subscriber to the print edition, I can get access to the whole archive for a measly £20 a year. But a nagging doubt remains: this is a piece of information technology run by the British Film Institute, and their track record in IT matters is somewhat poor. The online box office for BFI Southbank has always had a reputation for being erratic, usually collapsing completely on the first day of booking for the London Film Festival. It was recently replaced with a system that was somehow even more baffling and unintuitive. (The big test was the first day rush for LFF 2012 tickets last week: the word on Twitter suggests that slightly fewer transactions than usual died in mid-flight. However, the system chose to spend most of that day annoying people by refusing to recognise Visa as a valid credit card provider.) Meanwhile, the S&S subs department has its own problems – earlier this year a simple request to change to a direct debit subscription, in order to take advantage of a DVD special offer, resulted in me becoming the proud owner of far too many copies of Barbet Schroeder’s The Valley. I was sent an email inviting me to upgrade my subscription, but it didn’t offer an online method of doing this: just an email address and a phone number. So I sent them an email. Four days later, I got a reply telling me to call the phone number. When I phoned the subscription department the first time, they told me there was a mistake on the website, and the archive cost £65 a year rather than £20. Eventually, we managed to work out between us that £65 is the combined price of a print subscription and archive access, rather than a mispricing. I gave them my details, and they said they’d get back in touch with me. They didn’t. After a couple of weeks, I chased them again, and they eventually provided a username and password to the archive. But it only gave me two years’ worth of back issues, which is the limited offering given to print subscribers who haven’t paid for the full archive. Every so often, I keep calling to ask why I don’t have full access yet. The latest theory appears to be that it somehow takes over a month to update a direct debit. Well, this is where I come in, as my subscription to the digital edition of Sight & Sound came through fairly quickly and straightforwardly. In fact, even though I haven’t yet paid the extra £20 for the entire digital archive, I seem to be able to access it for the moment. Which explains why I am writing this under my pseudonym: I really hope nobody notices and takes my added bonus away. Unfortunately, before I get on to reviewing the archive proper, I have to extend Spank The Monkey’s litany of complaints about the BFI’s digital presence. About the only thing which did work for me was the registration of my magazine subscription details for the digital editions. Everything else… oh dear. It made perfect sense for the BFI to revamp not only its venerable film magazine but also its website in time for the September 2012 issue, with its newest update to Sight & Sound‘s ten-yearly Greatest Films Poll. At no other time each decade is the magazine’s profile as high. However, given the BFI’s history in IT matters mentioned by Spank above, it was perhaps wildly optimistic to attempt to do all of the above to this deadline. And so it appears to have proved. The promised digital editions were online later than promised. The confirmation emails I was sent contained my password in plain text. The new BFI website is a disaster. Try actually finding Sight and Sound if you don’t have a link; there is no sign of it per se on the homepage (though there are a couple of articles from it), and the keywords at the top don’t immediately suggest the magazine either. Click on “News & Opinion” and you’re getting closer, and then it’s just one or two clicks more to reach the Digital Desktop Edition and Archive. Is there no way to streamline this? (It’s not just Sight and Sound; the main purpose of the BFI revamp seems to have been to make hitherto easily accessed parts of the website as obscure as possible. Want the BFI Filmstore? You need to find the teeny-tiny link to “Shop Online” under “Shortcuts”, right at the bottom of the homepage). And it pains me to report that – even if you’ve made it this far – the technical problems continue. The “Clippings”, “Print Pages” and “Download PDF” functions (this last only available for newer editions) have never, ever worked for me. Navigation is straightforward but the search function leaves a lot to be desired. Searches can be narrowed by date, or widened from the current edition to all of them, which is good, but unfortunately, when you click on the search results, this just opens the relevant issue. So you either have to search again or go back to your original search, see what page the results were on, enter this manually, and then look over the screen until you find your keyword. If it feels tiring reading about this, just imagine how bad it is to have to do it every single time. The BFI should be having urgent discussions with its digital publisher, PageSuite. So, what about the positives? Well, the quality is fine, especially for the most recent, all-digital editions. As one would expect, the iPad App, restricted to the past two years of back issues, is especially clear. Even the older editions, which have been scanned to PDF, are surprisingly well defined, and what the pages might have lost in clarity they make up for in historical charm, with ever-so slightly yellowing pages, or (to take a random example) some squiggles in green ink on a page of “newest video releases”, presumably made by a conscientious BFI librarian. It’s a bit of a shock to realise that the magazine was in black and white until the May 1991 issue, when Sight and Sound was merged with the MFB and went from being a quarterly to a monthly. Those were the days. (Favourite thing in this edition, from the editorial: “Sight and Sound… has no interest in nostalgia for the good old things”. Yeah, right. 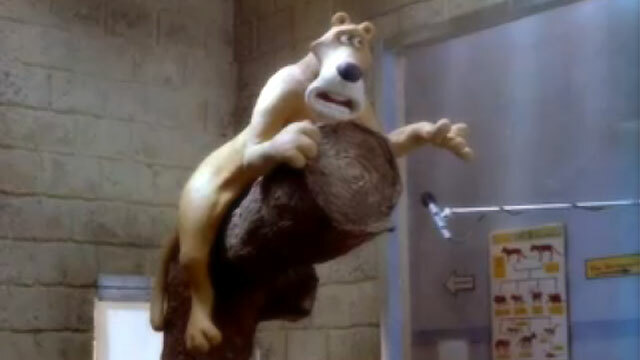 Second-favourite: a full-page colour ad for “Creature Comforts, Academy Award Winner 1991, Coming in June on Video”). Actually, as a connoisseur of ancient adverts, I’m a bit sad that most appear to have been omitted from the scans of older issues, apart from a few at the beginning and end, or when they share the page with an article. It may seem like a minor quibble but it has two disadvantages: the page numbers listed in the index no longer match those of the PDF, and you’re left with reams and reams of unleavened text, often with very few pictures to break up the erudite film discussion. The result is that skimming can, at times, feel a bit like being hit over the head with a bound edition. And yet, excised adverts aside, the Digital Archive is still film history in its contemporary, unedited form, and that is the most wonderful thing about it. Think of it as a corrective to the increasingly codified version that has been handed down over the years, or even as an antidote to Sight & Sound‘s own Greatest Films Poll, if you will. There is no Film Canon here, it is still being written. There are filmmakers you’ve never heard of being praised as the Next Big Thing, and movies that have disappeared without trace hailed as masterpieces. Negative reviews of films now held way up high in critical regard, and perceptive articles about directors that you love, written in the middle of their careers and without the benefit of hindsight. So many actors, writers, critics, and directors brought, briefly, back to life – something that usually only the movies themselves can do. Virtually any issue will throw up many examples, but I am going to pick just one, the Summer 1935 edition. On the cover we find Miriam Hopkins, star of the first feature film to be shot entirely in 3-strip Technicolor, Becky Sharp (though the photograph itself is in black and white). Inside, after ads for a 16mm. Sound Film Projector, INDUSTRIAL FILMS of EDUCATIONAL INTEREST and How To Play Tennis by Fred Perry, there are pieces on Religious Films by the Bishop of Croydon; Music and the Film; The Evolution of Cinematography; an appeal for a National Film Library for Great Britain and, most chillingly, a short article with a long quote from Joseph Goebbels pontificating on the Film Ideals of Present Day Germany (“The film must free itself from the vulgar mediocrity of a mob amusement, but in doing so it must not lose its strong inner connection with the people”.) Alistair Cooke reviews a Pabst season, The 39 Steps and Roberta, none of which he thinks much of, and G Men, which he likes a lot, but his biggest praise is reserved for a John Ford number called Passport to Fame (aka The Whole Town’s Talking). Nope, me neither. Like Spank The Monkey, I have been a Sight and Sound reader and subscriber for a long, long time. I have boxes filled with back issues squirreled all over my house. On the sideboard in my bedroom is a pile of magazines going back five years and over 1 foot deep. I regularly take copies with me when I’m teaching and wave them at my students: a Woody Allen quote when talking about the Cinema of Attractions here, a “Greatest Films Poll” when discussing Citizen Kane and the Film Canon there. The Digital Archive could have been made for me. All those venerable paper editions, easily accessed in digital form! But how sad – not to mention ironic – that dysfunctional modern technology threatens to spoil the experience.